Take a bowl, add all the ingredients and knead dough. The water should be slightly warm. Keep it aside for 15-20 minutes. Make 12-14 small balls and roll into plain flour and roll the tortillas of about 4-5 inches diameter. Prick it with a fork or knife. Take a non - stick tawa and cook it on both the sides till it turns light brown. Wrap it in the muslin cloth to keep it warm. You can use it immediately or you can wrap in zip lock bag and put it in the refrigerator. You can store it till 10-12 days. You can have your choice of taco shells - soft tortillas or fried ones. Take a kadai/wok and heat oil. Deep fry tortillas on both the sides and turn it into U shape while it is still hot. Your taco shells are ready. Keep it aside to cool it. 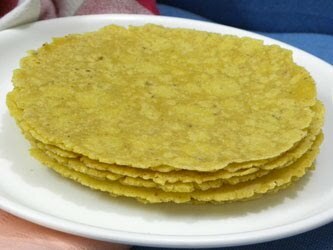 You can also use ready made tortillas/taco shells. Deep fry and use it immediately. If you want to use soft taco shells then put ½ teaspoon of butter on a tawa/skillet and cook it on both the sides for few seconds and fill it up with the stuffing. Note: You can use wheat flour also instead of maida.